We will be happy to answer all your questions and even arrange a Free Demo! David Jones, Rahul Patel and Tara Bonnett during the presentation of an AED donated by HeartSine to Rahul's school. The use of a HeartSine Samaritan PAD Automated External Defibrillator saved Rahul’s life when he collapsed at Lea Manor Sports Centre in Luton. 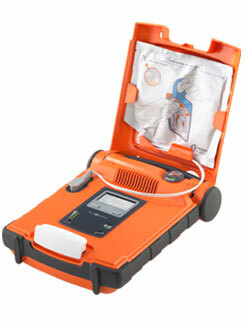 Fully Automatic Professional Quality Defib. The Cardiac Science Powerheart G5 has the reliability, ease of use, and advanced therapy to help you save a life. The Powerheart G5 is the first AED to combine real-time CPR feedback, fully automatic shock delivery, variable escalating energy, and fast shock times. These powerful capabilities enable rescue professionals and lay responders to administer therapy in a timely and effective manner to give a victim of sudden cardiac arrest the best chance of survival. The Powerheart® G5 is the first AED to combine real-time CPR feedback, fully automatic shock delivery, variable escalating energy, and fast shock times. Order the Cardiac Science Powerheart G5 Defib here! Why buy a Cardiac Science AED Defib? The Cardiac Science range of portable AED Defibillators are the market leaders in the USA and they are widely recognised to be the best defib units available. This is why they are used by major organisations such as the NHS, The FA, most Ambulance Services, most Fire Brigades and countless private healthcare organisations and dental groups in the UK. Why buy an AED defib from us? With over 10 years experience of advising on and selling Cardiac Science portable AED Defibrillators, we have the expertise necessary to advise and guide you through your purchase. We are sole online agents for BOC, a Member of The Linde Group and we supply both Cardiac Science and HeartSine Defibrillators. We have direct access to the technical help in both companies, so you can also rest assured that we can provide you with the very best ongoing support.